Acoustic Pulse Therapy (APT) is a breakthrough therapy that penetrates through chronically injured tissue, breaking up the scar tissue, and creating a re-vascularization (new blood supply) to heal naturally. People with chronic muscle, tendon, and connective tissue pain often have old patterns that have developed. 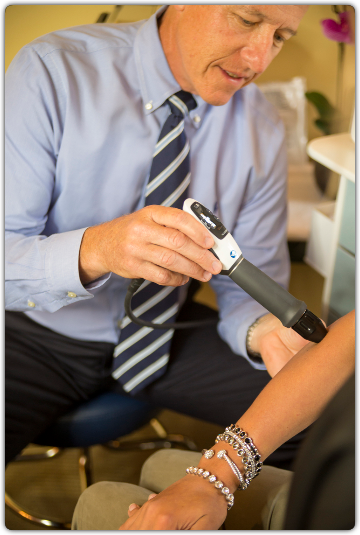 Acoustic Pulse Therapy, also called Shockwave, uses a hand instrument to generate a pulsing, Acoustic pressure wave that travels deeper into the surrounding tissue, spreading as it penetrates. Similar to the technology of our Radial Pulse Therapy (also known as RPT), our innovative equipment utilizes the science of these sound waves (i.e. Acoustic Wave/Pulse Therapy) to help repair, restore & rejuvenate muscle tissue. If you haven’t responded to other therapies for chronic soft tissue problems, or if you know that further results are possible, you have to try this therapy. Offering this therapy is just another example of Lake Country Health Center utilizing the latest technology aiding in producing amazing clinical results. 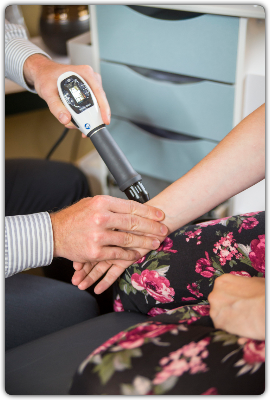 When it is used in conjunction with our other unique soft tissue therapies such as Class IV Laser and Interferential Therapy, expect results that you haven’t been able to find elsewhere. While treatment times may vary from patient to patient based on his or her condition(s), typically an average of 1,500-2,000 impulses are administered per session. This may take between 1 minute to 5 minutes depending on the area needing treatment. The total number of treatments if generally 6-12 depending upon a variety of factors which will be evaluated by Dr. Murray, Dr. Meye or Dr. Reimer. It is often important to remember that the immediate relief of pain, that this therapy provides, does not mean the condition is fully healed. After all, pain is the body's last response to issues under the surface. Therefore, if a course of therapy if suggested by the doctors, completing all of the treatments will improve your chances of long term success. Our goal is to keep you moving and feeling your best so that we don't see you for this treatment again in the near future. Different patients will benefit from different types of treatment options, this is why we have numerous therapies we offer. Dr. Murray, Dr. Meye, or Dr. Reimer are skilled in determining the best combination of treatments for each individual patient. You deserve the most personalized care! The team at LCHC is staying on the forefront of the latest technologies and developing the finest protocols for you. How to tell if you're NOT a candidate?